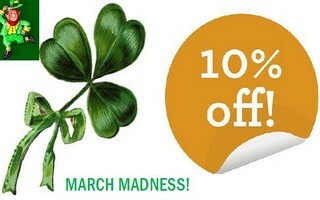 Avail of a 10% discount on any purchase.ie product throughout the month of March by simply inserting the discount coupon code “March Madness” at checkout when ordering online. Alternatively simply call us on 01 8428187 and quote the code and we will process your order with the discount over the phone. Purchase.ie now supplies over 250 great products to help you reduce your energy bills, conserve water and manage your waste better. Get shopping now at great sale prices. Find out what products our customers selected as their favourite Purchase.ie products. Read some Purchase.ie energy saving tips.